during the acute treatment phase of major depression. necessarily related to any treatment. It can also occur spontaneously in patients without treatment. 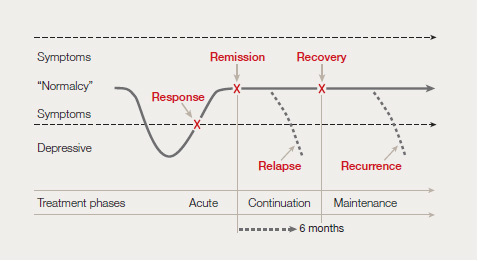 recovery refers only to the last episode and not to the affective disorder as a whole. treatment, which is of course one of the most important clinical implications of recovery. new depressive episode, unrelated to the prior, “cured” episode, respectively. Psihopatologia cantitativã a fixat praguri de severitate pentru definirea unui rãspuns terapeutic total (scor < 7 pe scala Hamilton - HDRS cu 17 itemi, sau scor < 8-12 pe scala MADRS, sau rãspuns nul sau insuficient, scor > 15 sau 18 pe Hamilton Depression Rating Scale, scor > 15-20 pe Montogomery Asberg Depression Rating Scale (MADRS).